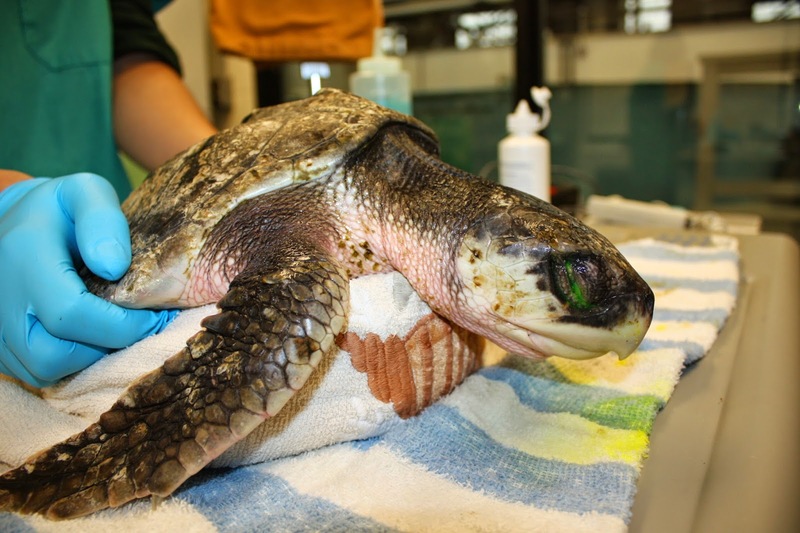 #32 "Golden Crisp", a rescued Kemp’s ridley sea turtle, was admitted last year cold-stunned. #32-"Golden Crisp" when first admitted; lethargic, emaciated, and cold-stunned. 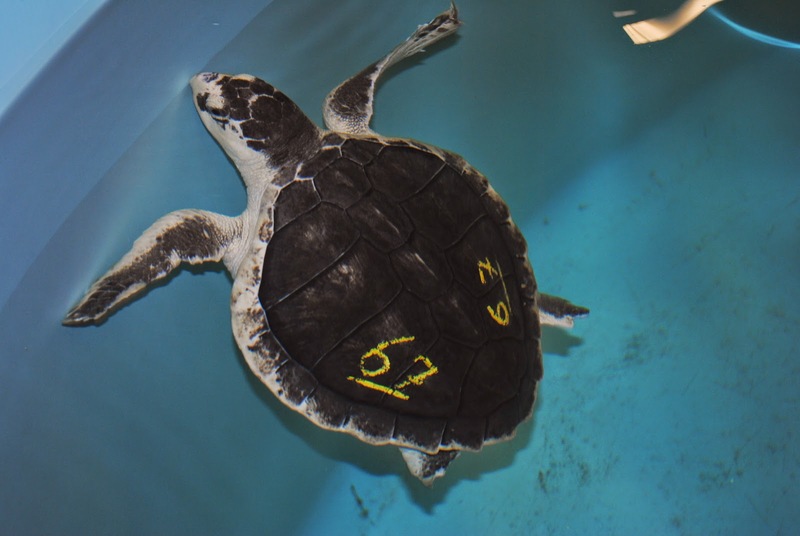 Once in rehab, staff noticed swelling in both front flippers and the left rear flipper. Coinciding with the swelling, "Golden Crisp" began to use these flippers less and less. 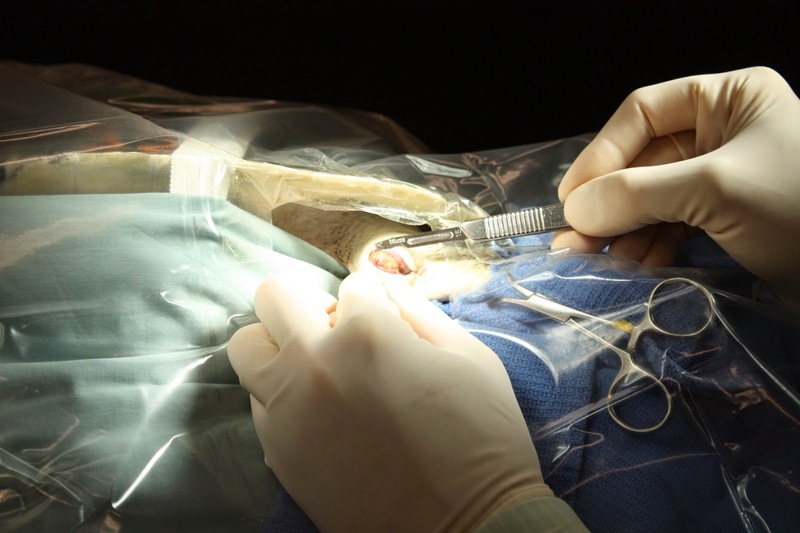 Radiographs, laser therapy, cultures and exploratory surgery were performed to help diagnose and treat "Golden Crisp." Laser therapy is used to help reduce swelling and promote greater range of motion. "Golden Crisp" undergoes exploratory surgery of the left rear joint and the left front joint. 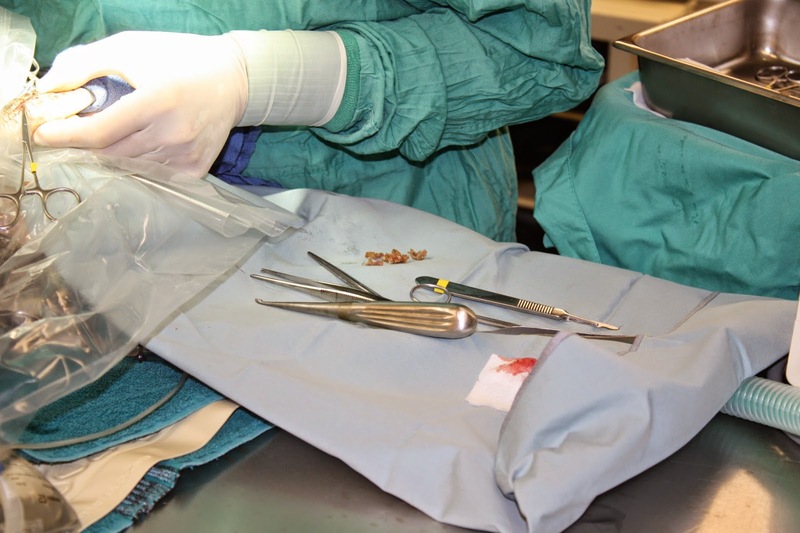 Necrotic bone and tissue were removed and cultured. After the surgery, "Golden Crisp" was moved to a different tank to encourage greater range of motion of the flippers. In the past few weeks since the surgery, this turtle has been using the right front flipper and rear left flipper more and more. #67 Kaboom: On the way to recovery! We've been following turtle #067—a rescued Kemp's ridley sea turtle—during rehabilitation after it washed up on a beach in Brewster, Massachusetts with hypothermia this fall. First she took a field trip for specialized diagnostics, then she had a brochoscopy and a laparoscopy. Today's post is an update on her recovery. 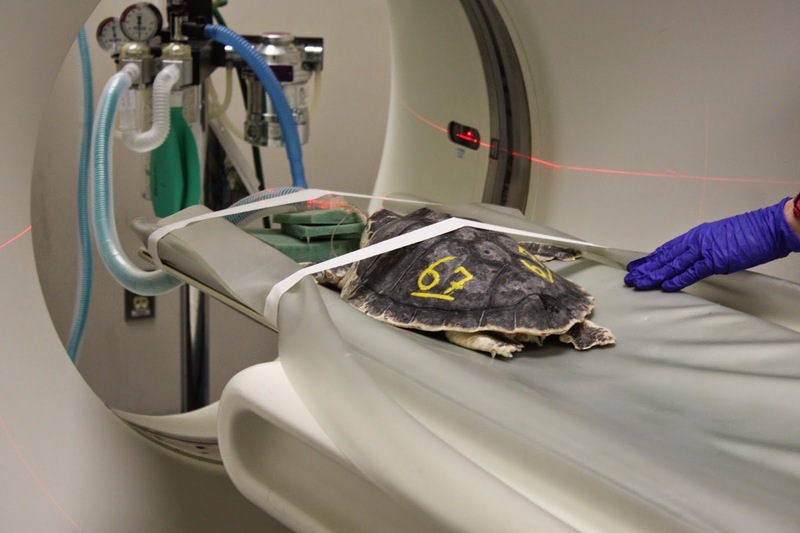 We would like to give you a quick update on Kaboom, a Kemp's ridley sea turtle that for a long time was our most critical patient. Kaboom "showing off" her beautiful shell! 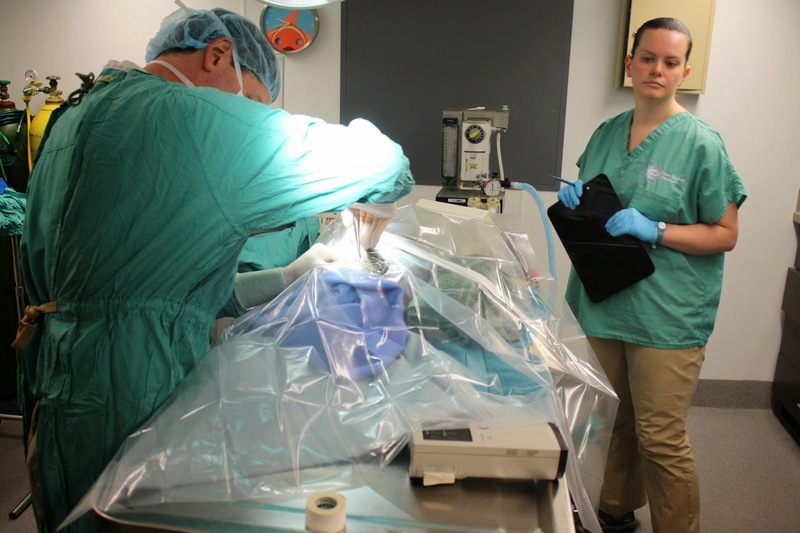 Back in January, Kaboom was transferred to the Veterinary Referral Hospital in Woburn, MA, for a CT scan, which revealed several areas of diseased lung and severe pneumonia. In the next couple of months Kaboom also underwent a bronchoscopy and a laparoscopy, to further diagnose the nature of her pneumonia and obtain some lung samples for better diagnosis. Based on the bacteria that was isolated from her lung tissue, Kaboom's prognosis was very guarded, but we all felt she had a fighting chance. She was started on three different types of antibiotics that were given to her both through injections and by mouth. Kaboom's appetite was initially very poor and the rescue team volunteers and interns had to work very hard to get Kaboom to eat her medications. Over the next few months, Kaboom grew stronger and stronger, her appetite increased and her overall appearance has changed dramatically. She morphed from this malnourished, skinny looking turtle with multiple scars and lesions on her shell and flippers to a beautiful, much healthier looking turtle. For those who have not seen her for longer periods of time, the transformation was so remarkable that many did not believe Kaboom was the same turtle they saw a few months ago. Just recently our veterinary staff scheduled a convalescent CT scan to see if the overall improvement in Kaboom's condition would be reflected in the results from the CT scan of her lungs. 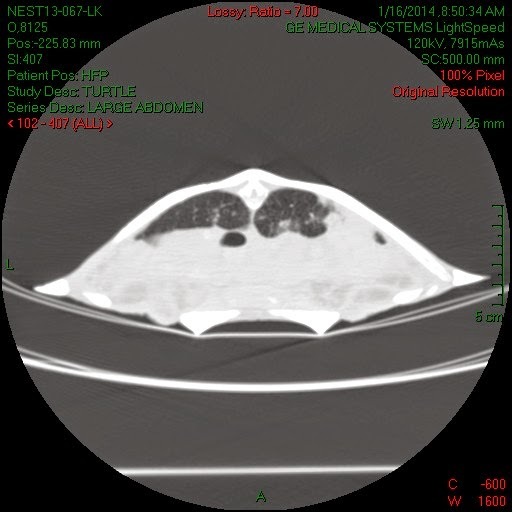 Below are two images of Kaboom's lungs, one from January and one from May. Even for an untrained individual, the difference is remarkable! 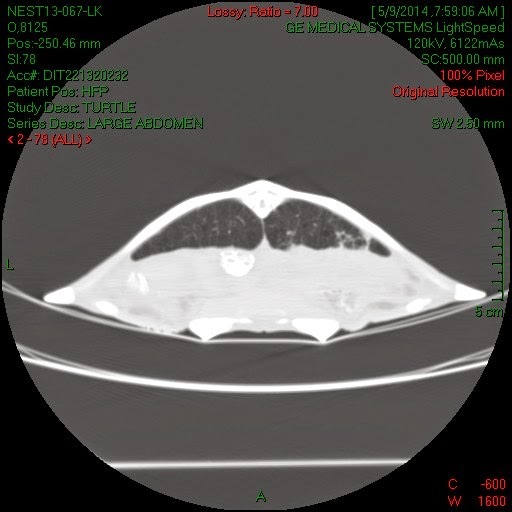 The lung area is the dark area in the upper half of the turtle, just under the carapace (upper shell). As you can see by comparing these two images, the lungs in January, especially the right one, have many areas of diseased tissue marked by "white" patches. The same areas in May are almost completely dark, which is healthy lung tissue. Kaboom on the CT table right before the procedure. Shortly after the CT Kaboom was discontinued from all antibiotics and is on the way to recovery! New England Aquarium Rescue Staff and Volunteers had the pleasure to take a trip up to the University of New England (UNE) Marine Animal Rehabilitation and Conservation program (MARC) to pick up and conduct a health study on four cold-stun loggerhead sea turtles that have been housed there over the winter for rehabilitation. These four loggerheads were admitted to NEAq last year suffering from cold stunning. At the time, we were inundated with cold stun sea turtles and running out of space. UNE MARC was ever so gracious in lending a helping hand, they agreed to take the loggerheads and to see to their rehabilitation. Now the four loggerheads have made a journey back to the Aquarium, where they will complete the rest of their rehab and be released in the near future. Take a look below to see a successful collaborative effort between NEAq and MARC! NEAq staff and volunteers prepare to take samples and data for a health study. MARC volunteers prepare to remove "Maple" from the tank. NEAq staff take blood from each loggerhead for a health study. Heart rates are taken on all the loggerheads with a use of a fetal Doppler. NEAq staff run blood assays on each loggerhead. NEAq and MARC volunteers work together to document time and behavior of the loggerheads. Once the turtles have been pulled from the tanks and have undergone a health study, they are taken out in a kennel and placed in the SUV for transport to NEAq. "Maple" takes a deep sigh while waiting to be placed back into the water at NEAq. A HUGE thank you goes out to UNE MARC for all their help and support!